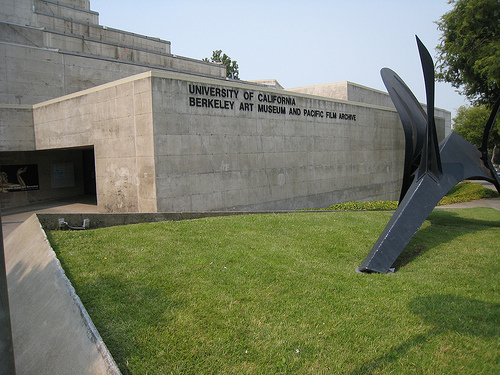 For the new Berkeley Art Museum, a world class architectural marvel? Realizing how hideously obvious that original plan was (not really; they just lost all their money), the BAM/PFA Board of Trustees has decided instead to “repurpose” a more working-class space. The proposition, pending various approvals, is to occupy the vacant 61-year-old rough gem formerly known as the UC Printing Plant on Center and Oxford streets. We figure you might care about the fate of BAM, given that, at its current Bancroft Way location, its gray mass probably monopolizes your visual field on a fairly regular basis. The new proposal is at roughly the same place that the Toyo Ito construction would have occupied. BAM wants to go downtown, ’cause apparently that’s where the city of Berkeley’s cultural and economic life force is concentrating itself. Where have you been? Image Source: mrgarin under Creative Commons.